× seven = 7 Required Please enter the correct value. The Winklevoss Bitcoin ETF (exchange-traded fund) will make investing in Bitcoin much easier for retail investors when it goes public next year. As the Bitcoin price continues to rise, and Bitcoin itself continues to move toward mainstream adoption, interest in Bitcoin investing will keep growing. One measure of adoption, daily transaction volume, has increased more than 2.5 times over the past two years. What Is the Winklevoss Bitcoin ETF? Formally known as the Winklevoss Bitcoin Trust, the Winklevoss ETF is a proposed exchange-traded fund that will make investing in Bitcoin as easy as owning a stock. 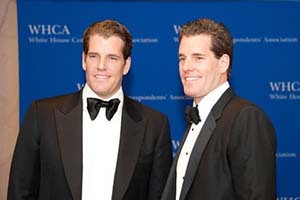 Who Are the Winklevoss Twins? If the names Cameron and Tyler Winklevoss sound familiar, it's because they engaged in a protracted legal battle with Facebook Inc. (Nasdaq: FB) CEO Mark Zuckerberg. The twins claimed Zuckerberg – a fellow classmate at Harvard University – stole their idea for a social network. In 2008, Zuckerberg paid the twins a $65 million settlement. That story is told in the movie "The Social Network." The twins were also members of the 2008 U.S. Olympic team, competing in the coxless pair rowing event. They came in sixth. The "Winklevii" now operate a venture capital firm, Winklevoss Capital, and a cryptocurrency exchange, Gemini, in addition to working on the Winklevoss Bitcoin Trust. It is believed the twins own nearly 1% of all bitcoins. How Does the Winklevoss Bitcoin ETF Work? The Winklevoss twins have often said their ETF will function similarly to the SPDR Gold Trust ETF (NYSE Arca: GLD). The Winklevoss ETF is backed by Bitcoin as GLD is backed by gold. Investors won't be buying bitcoins, though, but rather shares that represent the value of Bitcoin. According to the Winklevoss Bitcoin ETF's S-1 filing with the Securities and Exchange Commission, each share will represent one-tenth of a bitcoin. The shares themselves trade freely on the market, like any other stock or ETF. But behind the scenes, the Winklevoss Bitcoin Trust creates and redeems "baskets" of 10,000 shares as needed. "Authorized participants" – big brokerage firms – make the requests for the creation or redemption of baskets as demand for the ETF shares rise and fall. The brokerages are responsible for distributing the shares to the public, not the Trust. Also, it's the brokerage firms that buy and sell the bitcoins that back the ETF, not the Winklevoss Bitcoin Trust. When Is the Winklevoss Bitcoin ETF IPO? The Winklevoss twins initially filed their S-1 back in July 2013. So it's not surprising that some have doubted we'll ever see a Winklevoss Bitcoin ETF IPO. A rule change is necessary because no ETF has ever been based on a digital commodity before. When commodity-based ETFs arrived on the scene about a decade ago, they too required an SEC rule change. How long the SEC takes to approve the rule change will determine when the Winklevoss Bitcoin ETF IPO happens. The good news is that it isn't an open-ended process. There are a series of deadlines and optional deadline extensions. Ultimately the SEC has a maximum of 240 days to decide whether to approve or reject the rule change that would allow the Winklevoss ETF to begin trading (although it could decide sooner than that). Given the date when BATS filed the rule change request, a decision should come no later than March 2017. If the SEC does approve it, a Winklevoss Bitcoin ETF IPO would follow within a few months. Where Does the Winklevoss Bitcoin ETF Trade? Shares of the Winklevoss Bitcoin ETF will be listed on the BATS BZX Exchange. Earlier SEC documents had designated Nasdaq as the ETF's exchange, but the Trust switched to BATS in June of this year. What Is the Winklevoss Bitcoin ETF Ticker Symbol? The Winklevoss Bitcoin Trust ETF ticker symbol will be COIN (represented in Money Morning stories as (BATS: COIN). How Can I Buy Shares of the Winklevoss Bitcoin ETF? Investors will be able to buy shares in the Winklevoss ETF just as they would any other ETF, stock, or mutual fund. Can I Short the Winklevoss Bitcoin ETF? Once the Winklevoss Bitcoin Trust launches, the full range of ETF investment strategies, such as options and shorting, will become available. Is There a Minimum Investment for the Winklevoss Bitcoin ETF? Are There Other Bitcoin ETFs? One Bitcoin ETF is live, although it bypassed the arduous process that has delayed the Winklevoss ETF. It's Grayscale's Bitcoin Investment Trust, which trades on the OTC Markets under the ticker symbol GBTC. This fund went live in May 2015. However, BIT is not SEC approved. Unregistered shares can be purchased via a brokerage account, although public trading is very thin. Accredited investors can buy directly into the Bitcoin Investment Trust, but these shares are "subject to significant resale and transfer restrictions," according to the Grayscale website. A proposed Bitcoin ETF, the SolidX Bitcoin Trust, filed an S-1 with the SEC in July. The SolidX Bitcoin ETF would trade on the NYSE Arca Exchange. The SolidX Bitcoin ETF appears to be a copycat of the Winklevoss fund, but has no chance of getting approved before the Winklevoss ETF. But SEC approval of the Winklevoss Bitcoin ETF makes it more likely the SolidX fund will also get approval – as well as a flood of other Bitcoin ETFs seeking to get in on the action. Will the Winklevoss Bitcoin Trust Be as Volatile as Bitcoin? Since the Winklevoss Bitcoin Trust is intended to track the price of Bitcoin, it stands to reason that it will also track the digital currency's price swings. 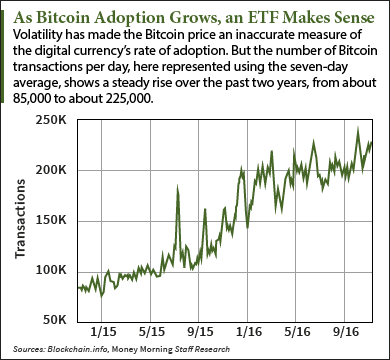 But because a Bitcoin ETF will open up more price discovery mechanisms like options and shorting, it's likely that the Winklevoss ETF will help make Bitcoin less volatile. If Bitcoin Collapses, What Happens to the Winklevoss Bitcoin ETF? Bitcoin is like any other investment. While it could make people wealthy, it could also go to zero. If Bitcoin is found to have a fatal flaw, or if a competing digital currency supplants Bitcoin in the future, the price of Bitcoin could go to zero. Any Bitcoin ETF would drop in value accordingly, including to the point of becoming worthless. But that's the same risk investors take with stocks. Remember, investors in mighty General Motors Co. (NYSE: GM) lost everything in 2009 when the automaker went bankrupt. That said, Bitcoin has a lot of positive catalysts going for it, including strong interest from the world's biggest financial institutions. Does the Winklevoss Bitcoin ETF Have Any Advantages Over Buying Bitcoin Directly? Yes. Investors who don't want to fuss with buying Bitcoin from exchanges or dealing with Bitcoin wallets are better off with a Bitcoin ETF. In addition, those who buy Bitcoin directly must personally track the cost basis for every purchase. When you sell Bitcoin, the IRS taxes the difference between the sale price and your initial cost. With conventional investments – or the Winklevoss ETF – your broker keeps track of this for you. Will Investing in the Winklevoss Bitcoin ETF Affect My Taxes? The IRS will treat any gains or losses you have as the result of owning the Winklevoss Bitcoin ETF the same as any other stock or ETF you own. Can New or Changing Regulations Affect the Winklevoss Bitcoin ETF? Multiple government agencies, as well as state regulators, continue to monitor Bitcoin to determine if they need to write new rules to deal with the digital currency. But even if new Bitcoin regulations are created, the only impact on the Winklevoss ETF will be if they move the price of Bitcoin. Should I Buy the Winklevoss Bitcoin ETF? Bit coin and other such investments sound good to me. However, must learn more.